These 12 gauge rifled slugs, designed for low recoil, will turn your shotgun into "minute of deer” gun producing groups just a few inches wide at 100 yards. The low recoil design, originally designed for police and home defense use, will help anyone shoot better. However, it is particularly helpful to new shooters who want to discover the fun world of shotguns without the added shoulder pain. This case of 80 slugs comes in a reusable Plano ammo can. The 2 ¾” rifled slug weighs in at just under an ounce and travels at a velocity of 1300 feet per second, like a .357 Magnum pistol round with a much bigger punch! Fiocchi shotgun ammo is made right here in the USA with all the same care as the company's rifle and pistol rounds. Fiocchi Munizioni is a private ammunition manufacturer based in Lecco, Italy. Owned by the Fiocchi family since its founding in the 19th century, the company entered the US ammo market fairly recently in the 1980s. This new venture proved so successful that Fiocchi began producing ammo at its own plant in Ozark, Missouri. Today, the vast majority of Fiocchi ammo on American store shelves is American-made, including 100% of its shotshells and 95% of its centerfire rifle ammo. 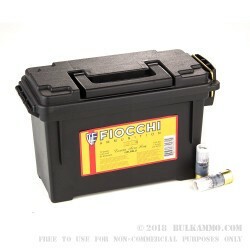 Poor: I would NOT recommend 12ga Ammo by Fiocchi - 1 ounce Low Recoil Rifled Slug ammo for ANY timed combat or tactical drill, exercise or engagement. Recently attended Law Enforcement Firearms Training that required specific amount of ammo loaded in magazine for drills. *In order to pass proficiency both shotgun AND ammo had to perform flawlessly under timed course of fire. I ran the ammo through my Mossberg 500 and 930. 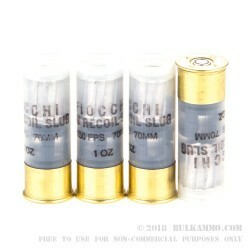 Using 12ga Ammo by 12ga Ammo by Fiocchi - 1 ounce Low Recoil Rifled Slug caused nothing but problems. Down range the shot placement was on target and tight grouping. However, while under hot-bore tactical drills I encountered constant issues with the empty shells hanging up in the port and not ejecting from both the 930, and while cycling the 500. The good news is I acquired and cycled Federal and Winchester brand ammo and passed with zero problems. For the price, the ammo is a good deal and on cold bore shots it was ok. 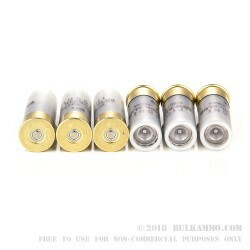 However, I would NOT recommend 12ga Ammo by Fiocchi - 1 ounce Low Recoil Rifled Slug ammo for ANY timed combat or tactical drill, exercise or engagement. Thanks bulkammo! Once again you made me a returning customer and I had to buy from you guys again because of your selection and your reliability! Fast shipping! Best performing slug for match play. Price is right. Zero at 50yrds and your golden. Good product with minimum recoil. Easily hitting targets at 80 yards with a remington 870 tactical. Not to mention pricing on all products on this website is a lot better than every other website I could find. I was told to shop here for good prices, great customer service, and fast shipping. That was Exactally what I got. outstanding 12 gauge slug shell! Q: Can you shoot these through a smooth bore shotgun ? A: Hello Tyler, Yes, you can shoot these 12ga. 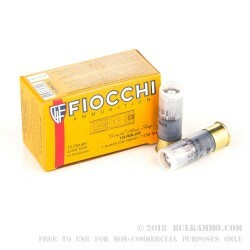 2 3/4" rifled slugs by Fiocchi in your smooth bore shotgun. Rifled slugs are designed to be fired in shotguns with a smooth bore barrel. Sabot slugs are designed for rifled barrels. A: Hello Ethan, Rifled slugs are designed to work in smooth bore shotguns. Sabot slugs are designed to work in rifled barrel shotguns. Most common shotguns have a smooth bore barrel in which case you would need rifled shells. Rifled shells have rifling manufactured into the slug itself to spin the slug as it travels down the barrel like how the rifling in a barrel in a handgun or rifle would work. Q: Are these slugs ok to use in a semi-auto shotgun, such as a Benelli M-4? A: Hello, These 1oz. rifled slugs by Fiocchi in 12ga. will work in a semi-auto shotgun. They are low recoil, but they cycle great in semi-auto shotguns. Q: Is this a sabot shell? A: Hello Nick, These 1oz. rifled slugs in 12ga. by Fiocchi are not sabot slugs. They are rifled slugs designed to be used in smooth bore shotguns. You can shoot them in a smooth bore 12ga. shotgun without any issues.